We wanted mind-blowing real + raw content all in one glorious + safe place. And what began as a love letter between friends, is now Amulet, a home + Protectress for modern sacred information in the visual, creative + writings arts. 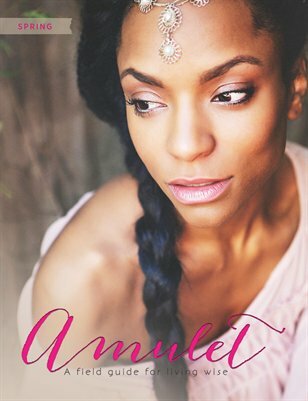 Amulet is a vessel for simple connections. It’s a field guide to not only wise living, but a place where we can boldly say: We are PeaceKeeper & WorldShaker. We are Mother & Other. We are what casts light and digs deep into the shadow of the soil. Here is what we do. We witness the seasons turn and the moon change shape and consciously take part in that dance. These have always been the ways of the woman, to time keep the seasons. We honor the rhythm that rolls with the beats and meters of the Earth,+ beyond. These rhythms are meant to ease our worries, smooth our stress, and bring us back to what nourishes us: our connections to Earth, our family, our creatrix, our community.